Universal Studios Hollywood Welcomes Hello Kitty to it’s All-New Animation Studio Store – Officially Opens Today! You are here: Home / SoCal City Kids News / Universal Studios Hollywood Welcomes Hello Kitty to it’s All-New Animation Studio Store – Officially Opens Today! 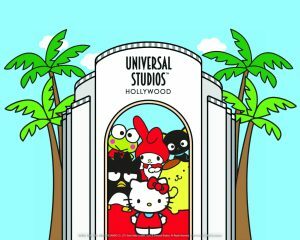 Donning her signature red bow, global pop phenom Hello Kitty joins Universal Studios Hollywood, taking up residence at The Entertainment Capital of L.A. in the theme park’s all-new, and now open, Animation Studio Store. In true Hollywood fashion, the spotlight shines brightly on Hello Kitty and her friends from Sanrio, including My Melody, Keroppi and Chococat, as they star in a selection of park-exclusive merchandise, including accessories, apparel, stationery, souvenirs and collectibles. An array of delectable confectionery—prepared fresh daily—is also available, including such tasty treats as Hello Kitty, Chococat and Keroppi themed s’mores, and a variety of Hello Kitty themed fudge, cupcakes and caramel apples. Highlights of the exclusive product offerings feature designs incorporating Sanrio characters into classic Universal titles such as Jaws, E.T. The Extra -Terrestrial, Back to the Future and more, as well as the group enjoying a variety of Universal Studios Hollywood theme park attractions, from the world-famous Studio Tour to “Jurassic Park—The Ride” and “King Kong 360 3D.” New park-exclusive merchandise will be released regularly. The shop also features the popular Hello Kitty Build-A-Bow display, inviting guests to customize their design from a selection of colorful bow options. Guests purchasing any Sanrio item will also receive a complimentary Hello Kitty Hollywood-themed temporary tattoo, which mirrors Sanrio’s ‘small gift, big smile’ philosophy that is demonstrated globally across all Sanrio’s retail stores and special events. Hello Kitty will also make special appearances just outside the entrance of the Animation Studio Store. Making her Hollywood debut in a red pleated dress embellished with film strips, Hello Kitty will meet and greet fans near a collection of Sanrio-themed topiaries, including My Melody, Keroppi and Chococat, and window displays featuring the characters making movies and enjoying the Universal Studios Hollywood experience. The Animation Studio Store sits at the heart of Universal Studios Hollywood in a new 6,000 square foot structure that draws its inspiration from California Mission revival architecture reminiscent of the Golden Age of Hollywood in the 1930s. Fusing style with whimsy, the retail environment weaves nimble animated characters into the fabric of the Spanish architectural design from the wood detailing to the stucco, wrought iron and painted tiles. The Carl Laemmle outdoor courtyard situated adjacent to the Animation Studio Store pays homage to the filmmaking pioneer and founder of the Universal movie studio inviting guests to dine or relax amid a decorative fountain surrounded by luscious greenery. Sanrio® is the global lifestyle brand best known for pop icon Hello Kitty®, and home to many beloved characters including Chococat®, My Melody®, Badtz-Maru®, Keroppi® and Gudetama. Sanrio was founded on the ‘small gift, big smile®’ philosophy – that a small gift can bring happiness and friendship to people of all ages. Since 1960, this philosophy has served as the inspiration to offer quality products, services and activities that inspire unique consumer experiences across the world. Today, Hello Kitty’s legendary breadth of products is available in over 130 countries and in retail locations including department, specialty, national chain retailers and Sanrio boutique stores. To learn more about Sanrio, please visit www.sanrio.com and follow on Facebook, Instagram and Twitter – @sanrio,@hello kitty. Universal Studios Hollywood is The Entertainment Capital of L.A. and includes a full-day, movie-based theme park and Studio Tour. As a leading global entertainment destination, Universal Studios Hollywood delivers highly themed immersive lands that translate to real-life interpretations of iconic movie and television shows. Recent additions include “The Wizarding World of Harry Potter ™” which features a bustling Hogsmeade village and such critically-acclaimed rides as “Harry Potter and the Forbidden Journey” and “Flight of the Hippogriff™,” Universal Studios Hollywood’s first outdoor rollercoaster. Other immersive lands include “Despicable Me Minion Mayhem” and “Super Silly Fun Land” as well as “Springfield,” hometown of America’s favorite TV family, located adjacent to the award-winning “The Simpsons RideTM” and the “The Walking Dead” daytime attraction. The world-renowned Studio Tour is Universal Studios Hollywood’s signature attraction, inviting guests behind-the-scenes of the world’s biggest and busiest movie and television studio where they can also experience such authentic and immersive thrill rides as “Fast & Furious—Supercharged.” The adjacent Universal CityWalk entertainment, shopping and dining complex also includes the all-new multi-million dollar, redesigned Universal CityWalk Cinema, featuring deluxe recliner seating in screening room quality theatres, and the “5 Towers” state-of-the-art outdoor concert stage.